Alright, let's start with some theory. Don't worry, it's easy and it will only take five minutes or so. All we have to know is that everything in C++ has a type. Now in reality, a bottle can contain just about anything: water, beer, sand or whatever. In some programming languages this is the case too, where things can have just about any type. But in C++ it's (for some complicated computer science reason) different. 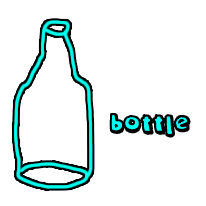 C++ wants us to specify what type of bottle we have: is it a water bottle (that can contain all different kinds of water), or is it a beer bottle (that can contain all kinds of different beer flavors) and so on. That's all there is to know about data-types theory. a bunch of characters like "abcd" or "abc 123"
Okay so we don't like math, so we use C++ to find out what 1 + 2 is. If we look at the list of data-types above, we can see that 1 and 2 are both values of type int. And if we combine two int values, that makes the result an int value again (3 is obviously int). Generally speaking: if we do something with two data-types of type 'WHATEVER', then the result is usually the data-type 'WHATEVER' again. Now the question is: what happens if we use C++ to calculate 1 + 0.5 where 1 is a int value and 0.5 is obviously a float value? 1 + 0.5 results in 1.5, which is a a float value. Hence we need a float value. That's not that hard right? We just saw four kinds of data-types for numbers like 1, 2, 3, ..., which is because of limitations in our computer's memory. Obviously its not infinitely huge, that's why there are data-types for 'small numbers', 'bigger numbers' and so on. which shouldn't confuse us. The reason for the f at the end is to let C++ know that it's a float and not a double value. If those data types really freak you out, then just go with float for all numbers, string for all "words" and you are fine for now.